Hi. It’s me, Opie, the dog of the store manager. I’d like to introduce you to my friend, Eleanor Roosevelt. ^ That’s her. 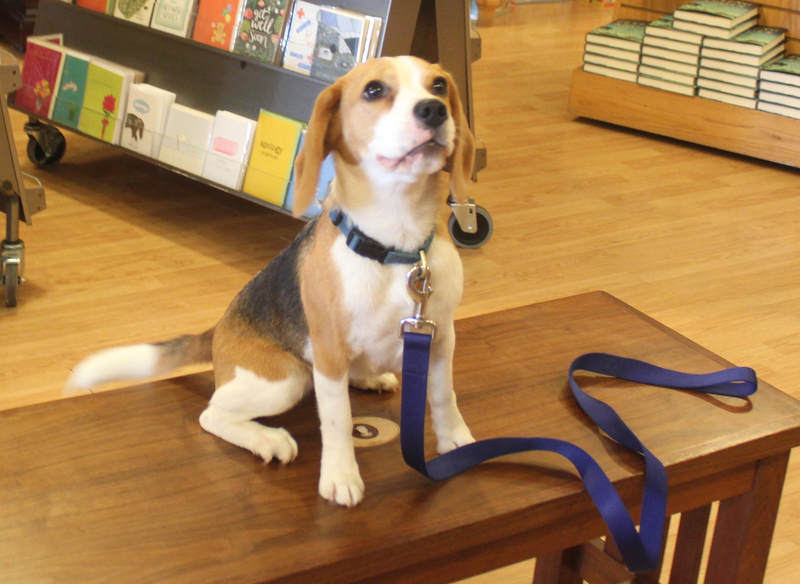 She used to be the “special correspondent” of our shop dog team, but now that she’s not a baby anymore, it’s finally time for her to start work at the store. That’s where I come in. 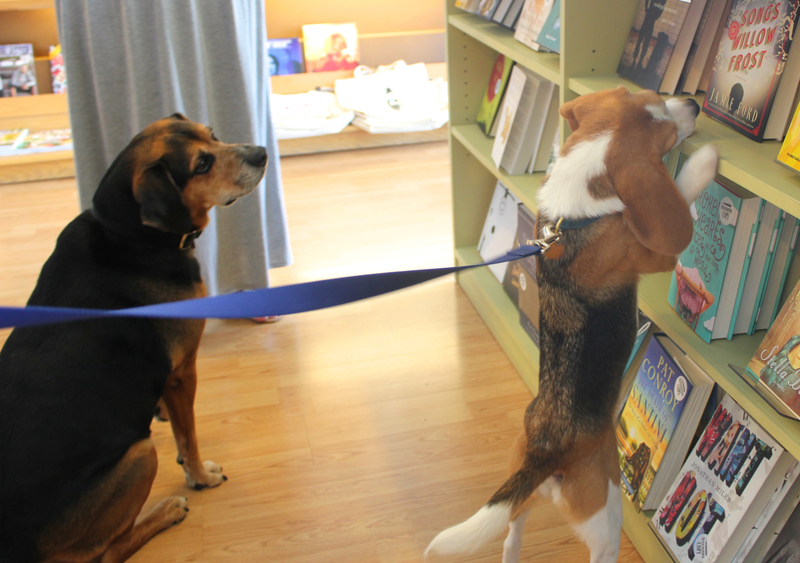 As senior store-hound, it’s my job to teach the junior store-hound how everything works. Here’s how the first day went. Step one: The interview. My Andy asked Eleanor about her greatest strengths (cuteness and sniffing), her biggest weakness (fear of garbage trucks), and her favorite book (My Dog: The Paradox by Matthew Inman). 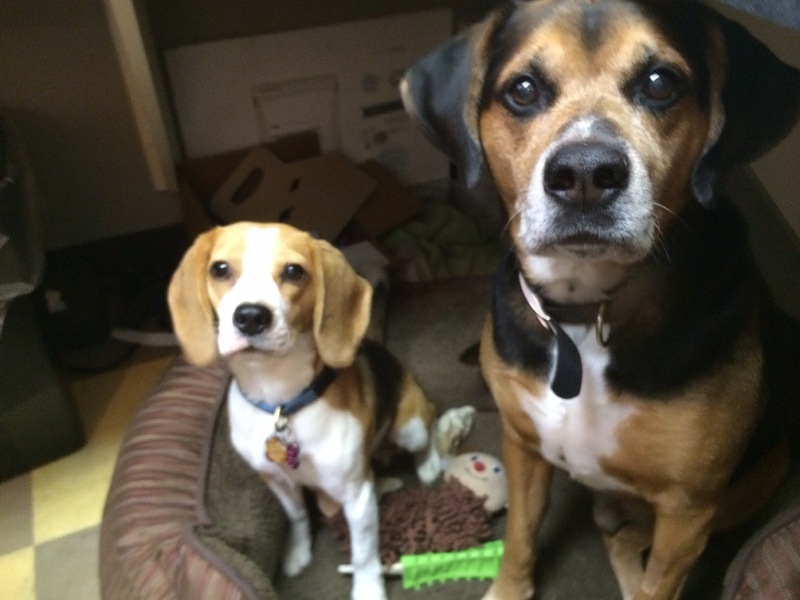 They negotiated the salary for a while, ultimately agreeing two biscuits per day would be a good start. Then they shook hands, and Andy proclaimed her ready to begin. Next, we received our instructions from the store people. I was to take Eleanor Roosevelt around the store for a training rotation with each department. Got it. 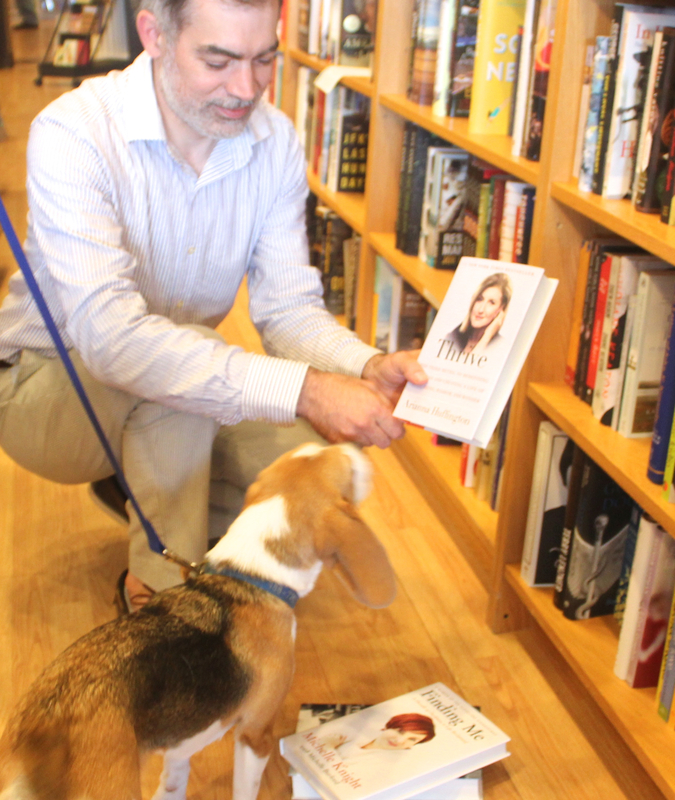 I made sure Eleanor Roosevelt got to know each bookseller. Here, you can see Nathan showing her where to find books by strong female leaders (in the biography section, of course). When you’re short, sometimes it’s fun to make yourself tall. You can see EVERYTHING from up here. We had a grand ol’ time climbing on the chairs until Andy said it was time to get down and back to work. Then it was time for a test: Let’s say a customer comes in and requests an autographed book to give as a gift. Where do you go to fetch it? 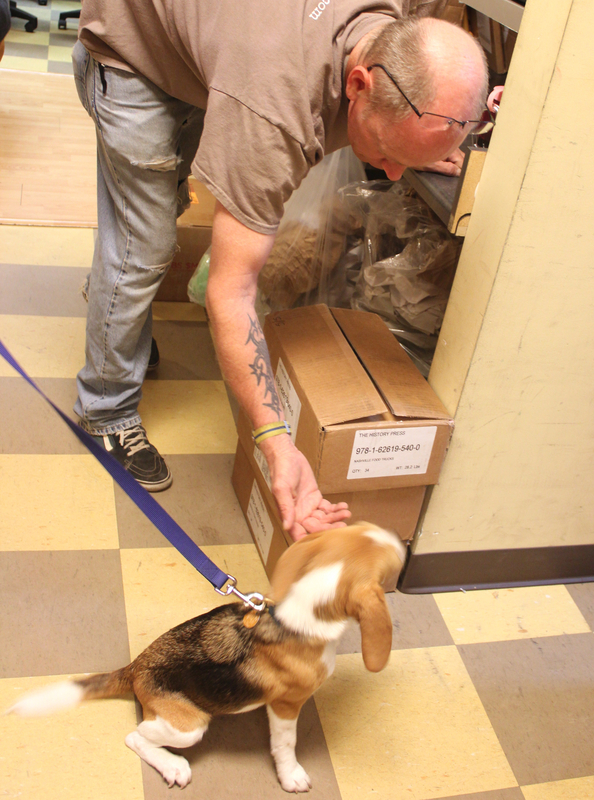 Then we checked in with Pete, the receiving manager, to find out what was in all those boxes that had just arrived. Eleanor Roosevelt learned that Parnassus receives stacks and stacks of packages every day, full of regular stock and special orders for customers. I also passed along an important tip: Pete gives great ear-scratches. 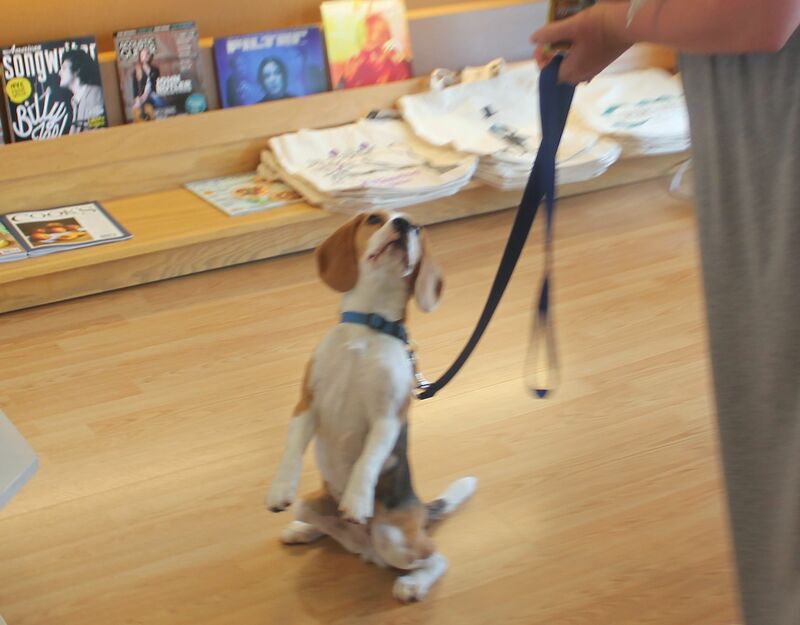 Then, just for fun, Niki taught Eleanor Roosevelt to do the “Sparky sit.” This is Sparky’s famous move: sit up, show how cute your belly is, and look pleadingly at someone until that person gives you a biscuit. Personally, I find the circus act a bit twee for a dog my size, but the little ones can really pull it off. We did a quick pass through the children’s section, where the small customers are always friendly. 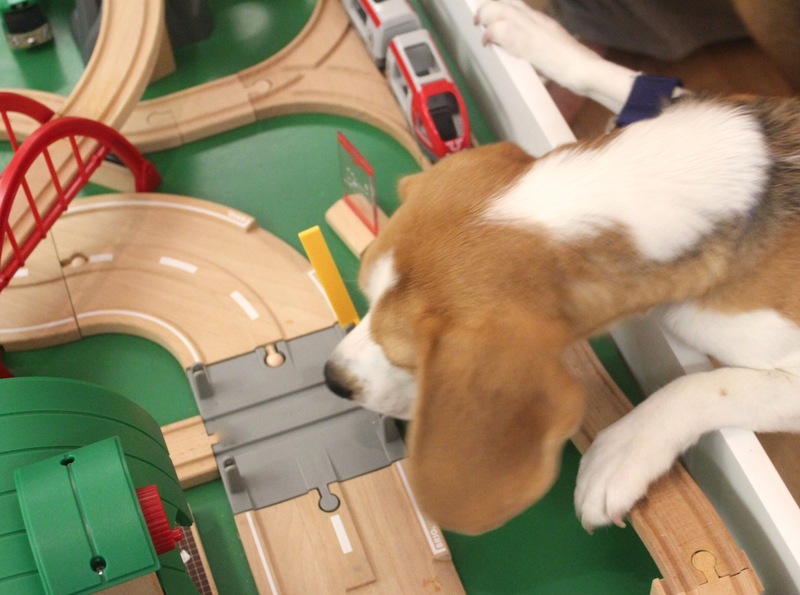 Eleanor Roosevelt checked the train table to make sure everything was running smoothly. HoooOOOoo, what a day. Time to settle into one of the shared doggie-loungers for a rest. I declared Eleanor Roosevelt ready-ish for work (she does have to repeat the class on not howling indoors), and she celebrated by ripping the squeaker out of a stuffed monkey. Come visit soon, won’t you? 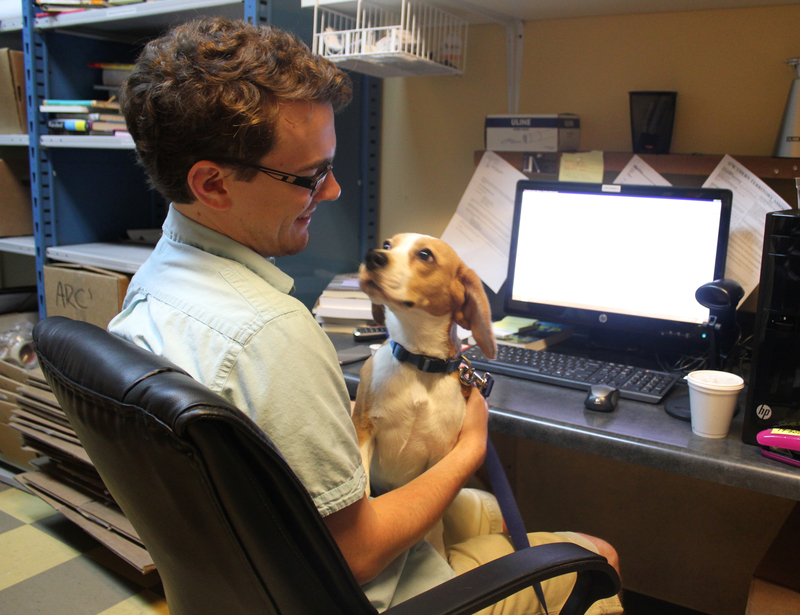 The shop dogs like all customers — even cat-lovers. And they love social media, too. Follow along on Facebook, Twitter, Instagram, and Lucky Stars (our tumblr) for candid snapshots and whatnot. NEW: Limited-edition posters, designed by Nashville’s own Sawtooth Printhouse. Only 150 were made — available until they run out!